KINGMAN – Jason Jump, publisher and co-owner of the Kingman Leader-Courier and KCNOnline.com, will be the featured interview in an upcoming podcast produced by internationally-known leadership speaker Scott Cooksey. Cooksey, who lives in The Woodlands, Texas, focuses on leadership development. Cooksey’s endeavors include individual performance coaching, team development events, leadership workshops, speaking, and serving as master of ceremonies and event announcer. He also produces podcasts that can be downloaded and listened to as the listener is doing other things. He usually works with business professionals and organizations to identify and implement strategies that generate lasting client relationships, Cooksey said. Since 2009, he has worked with a broad spectrum of businesses across the United States, as well as the Caribbean Islands and Australia. Prior to that, he spent 13 years in banking and financial services. “Most of my work is centered around the idea of connection,” Cooksey said. That connection is the central thread of success, according to Cooksey. “If you want to be a better employer, employee, spouse or friend, you do that by making better connections with people,” he said. Cooksey said that having looked inside the organizations of many types of businesses, he sees that most of them face the same type of challenges. “As businesses get so caught up in solving their problems, they forget they are in business to solve other peoples’ problems,” Cooksey said. The soon-to-be-released podcast featuring Jump will be available in a number of ways. One will be through the Leader-Courier website KCNOnline.com. 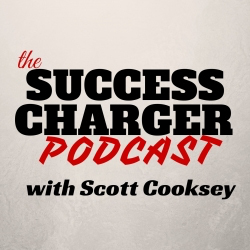 Another will be at his own website, successchargerpodcast.com. Subscribers to Cooksey’s iTunes channel can get a new episode each Tuesday. “It’s typically available about 3:30 in the morning,” Cooksey said. Jump said the podcast opportunity was very humbling and great exposure for Kingman and Kingman County. “Scott has seen a lot of success over the last couple of decades, and because of that he has been in some pretty impressive company,” Jump said. “Because of that, it was a great honor to be asked by Scott to be a part of one of his new projects; to think he says value in how others will receive what we have been able to do here in Kingman over a short amount of time is very humbling. I’m excited for the positive publicity this will be for our great community and county. Website Exclusive: Here’s a photo of Publisher Jason Judmp, Host Scott Cooksey, and successful business-woman Lori Word-Harrison circa 1990 in characters they played in the Ardmore High School production of Li’l Abner in Ardmore, OK.
"...hard working and has solid integrity. He gets things done." '...a dynamic speaker who knows sales, business & how to motivate..."
"He truly connected with the audience, presented insightful wisdom & many applicable take-aways...Highly recommend." "...sees a need & takes personal responsibility for it being met." "Scott is bright, caring, and professional...Work with him and you'll be pleased." "...positioned me perfectly for my presentation."
. -Jim Cathcart, Cathcart Institute, Inc. Discounted bulk orders available. Contact us for a quote.